Murdered and dismembered Jamal Khashoggi, an act, according to U.S. intelligence agencies, that with “high confidence,” was carried out with the approval of Crown Prince Mohammed bin Salman. Is prosecuting a proxy war in Yemen that is needlessly creating a major humanitarian crisis, the starvation of hundreds of thousands of Yemeni citizens. Arrests, tortures, gives excessive prison sentences to, and even executes political dissidents. Kidnapped the Lebanese Prime Minister in 2017. Exfiltrates from the U.S., Saudi nationals studying in Oregon, arrested and facing criminal charges, flouting U. S. laws. Yet, these golfers are signed up to play: Dustin Johnson, Patrick Reed, Sergio Garcia, Justin Rose, Brooks Koepka, Henrik Stenson, and Bryson DeChambeau. You can see the full field here. Most people would not agree with all this, Dustin? Most people? How about anyone in their right mind? Sorry, guys, this isn’t about politics or what you don’t agree with or support. Politics is about what federal income tax rates should be, or whether a wall should be built along our southern border. You can agree or disagree, support or not. What’s happening in Saudi Arabia is different, It’s criminal. It is the crime of the state against individuals, and in the cases of Khashoggi and the Oregon exfiltrations, crimes against the concept of international sovereignty as well. Mohammed bin Salman is a young man drunk on his own power, not only turning his country into a toxic state, but exporting its terror beyond its borders. THAT is why playing in the Saudi International is a mistake that the participants have no good answer for. I don’t expect professional gofers to be experts on current affairs or international relations. I do expect them to be able to see outrageous behavior clearly and respond appropriately. The money they say they are playing for? These are business that stood to make LOTS of money in Saudi Arabia, and they washed their hands of partnerships for the time being. But there’s money to be had, so golfers are going. Tell me, how much money is Jamal Khashoggi’s life worth to you? You guys stand to make more money in one week than the vast majority of people in the world will make in their lifetime, yet you want more. If what the Saudis are doing is not where you would draw the line, then where is it? I would also ask, could the winning golfer, in good conscience, stand next to the Crown Prince for a photo at the end of the tournament? Would he really not know what stain that would place on his public image? This conversation occurred between me and my wife after I got back from hitting a golf ball around the big field near my house with a 6-iron. Me: I learned something today, for the umpteenth time, and maybe this time I’ll remember it. But I’m never sure. Wife: And what would that be? Me: We, and by that I mean every golfer living, wants to hit the ball a long way. Wife: What’s wrong with that? I would want to do that if I played golf. Which I don’t. Me: But which you will someday, knock on wood. The thing is, we keep thinking to hit the ball far, we have to hit hard. That means swing hard. In reality, all we have to do is put a swing on the ball, with the distance the designer built into the club, and we get all the distance we need. Wife: In other words, stop trying so hard to make it happen. 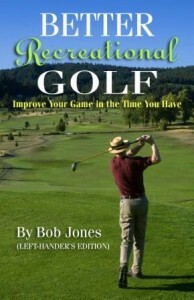 Wife: And you’re still learning this after having played golf for how long? Me: Sixty years this coming June, but that’s beside the point. It just seems natural to want to hit hard, We try not to, but we can’t help ourselves. It’s like we don’t trust the swing and the club to get the job done. It’s so effortless when you do it right that we really can’t believe it. Wife: So why don’t you just say to yourself you’re going to swing easier, then do that? Me: I do. And I suppose other golfers do, too. I take the club back easy, but when I finish my backswing and am about to start the club forward, I think, “HIT THE BALL!” and all my self-restraint goes out the window. Me: That’s right, and that’s what I did. Right before I started the club forward, I said to myself, “Center of the clubface.” Or rather, I thought that, because it’s quicker to think that than to say it. But it worked out the same. In this shorthand way, I replaced one conscious thought with a different conscious thought. You have to be thinking about something, and it’s just as easy to think about the right thing as it is the wrong thing. What this did is prevent me from adding that little extra something that doesn’t add, but subtracts. Now my swing was slower, but it wasn’t deliberately slow. I let my unconscious mind take over and it made me swing only so fast that I would be able to get that center hit, which is slower than my “hit” instinct wants. But, boy, did it work. Straight, great ball flight, and all the distance I want out of my 6-iron. It turns a power swing into a finesse swing that has power. Wife: So you finally have it figured out? This time for sure? Me: Yes, at least until the next time I hit golf balls. When I’ll have to “discover” this all over again. And I’ll come home and tell you all about it like it’s the first time. Again. 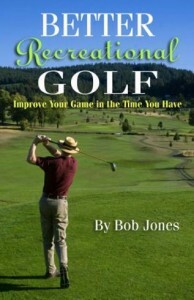 There are roughly 25 million recreational golfers in the United States. Thus, there are 25 million different golf swings. I try to put things in these posts that can be used by the greatest number of golfers, but I have no illusions that every swing will benefit from a particular post. I promise you, no matter who you are, if you work on these two things, which can fit into ANY golf swing, you will see greater improvement than by working on any other swing thing. If you’re new to the blog, read carefully. Magic coming up. First: Get your tempo right. Swing tempo is the overall speed of the swing—how long it takes the clubhead to get from takeaway back to impact. ➙ Swing the club only as fast as you can to hit the ball consistently on the center of the clubface. If you swing faster than that, golf is just one mishit after another. You lose distance and you lose accuracy. You might have to slow down your swing a bit to get to the center, but that will be more than made up for because the key to distance and accuracy is (drum roll) hitting the ball on the center of the clubface. Second: The clubhead must approach impact properly, and there is only one way for that to happen. 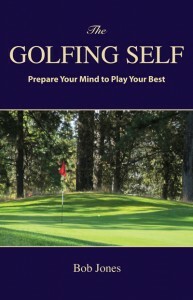 ➙ Your hands must be ahead of the clubhead at impact. Your hands must lead the clubhead into impact. The hands must pass the ball ahead of the clubhead. However you want to say it. Every good golfer does this. No bad golfer does it. It’s as simple as that. See this post on learning how to do this. If you spend a few months learning these two points, and get good at them, it will be like you’re playing a different game.